Pembrokeshire’s beaches have a reputation that the most haughty of Hyacinth Bouquets would be envious of. Everyone raves about them. Golden sand, family and dog friendly beaches, award winning beaches that are highly rated, outstanding examples of great British coastline. People flock to them all year round. But that’s where the problem starts. The Hyacinth Bouquets of this world are not ones for sharing the sand. And so we bring you 12 of Pembrokeshire’s beaches that everyone loves and are best avoided if you like to have every grain of sand to yourself. No, we haven’t temporarily transported you to Australia, although it does sound like it. This a very Welsh beach near Stackpole. And it has garnered worldwide acclaim over the years, regularly appearing in ‘top 20’ lists of beaches around the world. Part of its wow factor is the half mile walk required to reach this stunning bay. Though in turn this makes it inaccessible for some, sadly. Once there, you’re greeted by its gentle crescent curve. Once the private beach of the Cawdor family (wouldn’t that have been nice! ), it is now part of the Stackpole Estate that is managed by the National Trust. So similarly named and yet actually quite far apart. These are not two halves of one long beach. Freshwater East is a calm, wide bay of golden sand backed by dunes. When the weather’s good, there’s safe paddling for all the family. At the other extreme, Freshwater West is said to be one of the best surfing beach in Wales. Yet it’s also a commemorative spot for remembering one of the country’s worst tragedies of the second world war. From Australia, to Wales, to France. No, not really. While Manorbier has a French sounding name, switch to the Welsh and you’ll soon appreciate its origins: Maenorbŷr means Manor of Py. The golden sandy beach of Manorbier Bay glows beneath a cliff edge castle and Norman church that tower above it. A short hop from nearby Tenby, this south west facing beach is a decent surf spot. Edged by rocks it’s a pretty good spot for rock pooling too. This is the most northerly beach of the Pembrokeshire Coast National Park. Its proximity to Cardigan and the ancient village of St Dogmaels makes it particularly popular. So if you must visit, get there early. While you’re here, jump on a boat trip to go dolphin watching – people have been flocking here for years just for that experience! 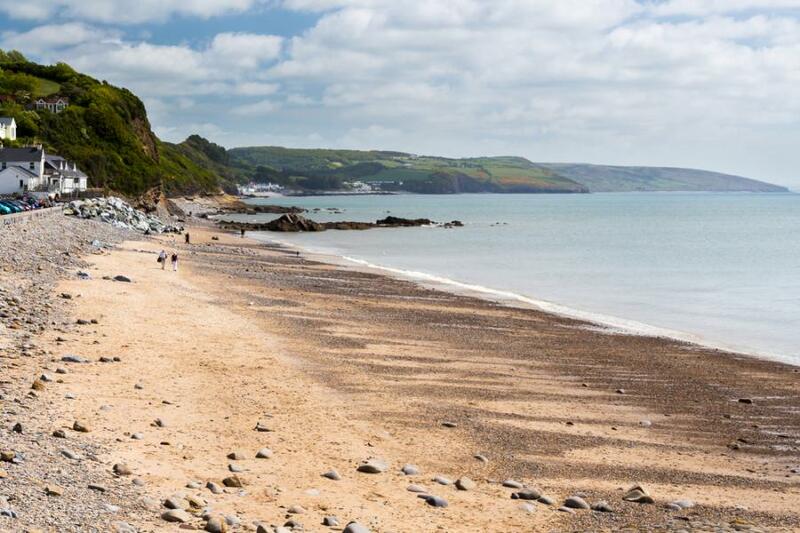 There’s really not much to like about this one… Saundersfoot is a small, vibrant and busy resort on the South Pembrokeshire coast, with a south east facing beach. Its golden sand and good swimming make it one of the most popular family escapes for a self catering holiday near the beach. Oh well. Accessible from the harbour or down the steps from the cliff top bandstand, this is a fabulous stretch of sand when the tide’s out. Only really accessible at low tide when you can also catch a boat for Caldey Island – that’d be much quieter, but they’re not allowed to leave you there. A dinky beach tucked beneath the harbour wall overlooking the colourful hulls of the harbour’s fleets. Great for sandcastle building while cooing over the fishing boats and other vessels. You won’t find Boaty McBoatface here, but there’s plenty to fascinate the young boating and fishing enthusiast. This is Tenby’s headline beach and one of the most photographed. Long, golden and sandy with stunning views out over Carmarthen Bay. Its golden reaches are interrupted briefly by the protruding Goskar Rock, but this is a family day out hotspot, be warned. When we tell you that this is one of the most popular surfing beaches in the whole of Wales, we’re telling you to get there early to bag a spot, if you must go there at all. It’s a beautiful wide expanse of pale sand in north Pembrokeshire leading towards St David’s Head. It’s overlooked by the imposing crag of Carn Llidi, just to remind you of Wales’ rugged landscapes calling those less inclined to spend their days grazing on the sand.